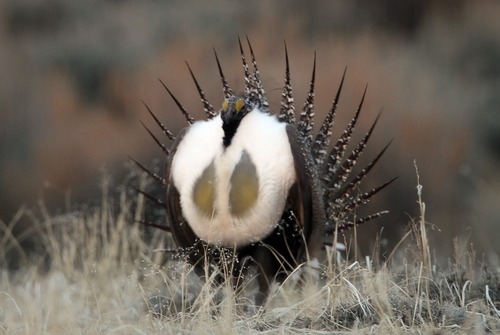 Rick Egan | Tribune file photo A male greater sage-grouse does his strut display near Green River Wyo., in March 2012. Rick Egan | Tribune file photo A male greater sage grouse struts near Green River, Wyo., in March 2012. Rick Egan | Tribune file photo A male greater sage-grouse does his strut display last year on a lek near Green River, Wyo. Brigham City • Poisoning ravens, pulling out pinyon and juniper, controlling noxious cheat grass and preventing fires are the hallmarks of a pilot program the Box Elder County Commission endorsed Tuesday in a formal bid to forestall listing of the greater sage grouse under the Endangered Species Act. Commissioners unveiled the plan in a packed meeting room in Brigham City&apos;s historic courthouse, where federal, state and local officials showered praise on this effort. The plan makes little reference to overgrazing, viewed among environmentalists as the leading culprit in the decline of the sage grouse, but officials promised it will improve habitat and reduce threats, chiefly wildfire and nest raiding by ravens. "We are trying to be good stewards of the land," said LuAnn Adams, the Box Elder commissioner assigned to public lands. "We hope [Bureau of Land Management officials] will follow our lead, but they have processes that they have to go through." Utah and several Western states are crafting sage grouse conservation plans with the help of local working groups and biologists. With its new pilot program, Box Elder is the first county to implement Utah&apos;s grouse conservation strategy, according to Kathleen Clarke, director of the state Public Lands Policy Coordination Office. "It is a beautiful complement to the state plan," Clarke said. State officials have so far declined to release the plan, arguing it is not public until federal wildlife officials approve it. The success of these state plans is essential in persuading the U.S. 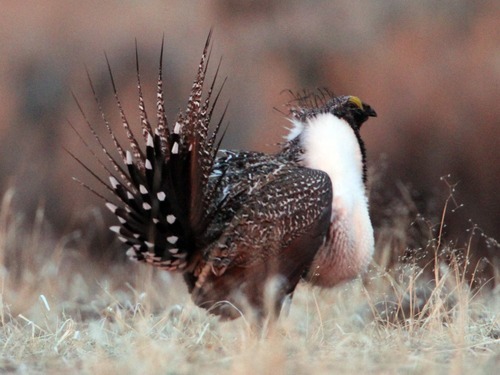 Fish and Wildlife Service to keep the greater sage grouse, one of the West&apos;s iconic wildlife species, off the threatened or endangered list. The agency is to make a listing decision in 2015. It is widely assumed that listing would result in restrictions on grazing and oil and gas development, with potentially devastating impacts to rural economies. The details of the Box Elder plan have not been worked out, but it will be modeled closely on a program in neighboring Elko County, Nev., and will unfold on private land in Grouse Creek Valley in Utah&apos;s northwestern corner. Elko officials are implementing their plan at Devils Gate Ranch, a 15,000-acre cattle operation not far across the state line from Grouse Creek. 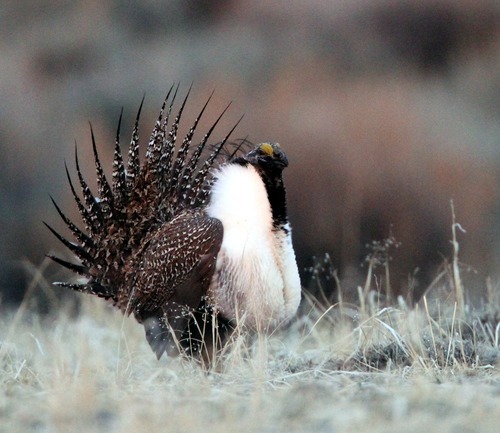 Agriculture officials began seeding Devils Gate with poisoned eggs last year to protect calves from ravens, but ranch owner Ken Bowler said he soon began observing big increases in the numbers of chicks hatching from sage grouse nests. He attributed this to the elimination of ravens near his irrigation system pivots. At Tuesday&apos;s meeting, congressional staffers read letters of support, and federal wildlife and agriculture officials endorsed Box Elder&apos;s move. "This action will make a difference. It addresses threats and has monitoring," said Larry Crist, who supervises U.S. Fish and Wildlife Service&apos;s Utah office. "I can&apos;t applaud you enough for taking proactive action. This is going to move us forward." In an interview, however, Jim Catlin, of the Wild Utah Project, questioned whether there is much scientific evidence that killing ravens and pulling juniper help grouse. Speaking about the Elko plan, he said it lacks regulatory teeth and thresholds to trigger mandatory actions. "This will increase the likelihood of listing if they don&apos;t collaborate with the conservation community," Catlin said. He noted the Elko plan ignores grazing&apos;s proven impacts on the perennial grasses and forbs grouse need for food and the cover to conceal nests from predators. "The effects of predation can be amplified by human activity. It&apos;s simple to go after something you don&apos;t like," he said. "Habitat that has too few native grasses is prone to cheat grass invasions. Grazing is one of the factors that promote more cheat grass." But state officials say any conservation program has to accommodate traditional uses of the land. "Ranching is not a bad thing for sage grouse ... ," said Troy Forrest, who runs the Utah Agriculture Department&apos;s grazing improvement program. "They like alfalfa, they like the open county that ranchers keep. "We have a great opportunity to do what [Elko officials] are doing and being successful," Forrest said. "We want to grow birds and have the ammo to show Fish and Wildlife that [sage grouse] doesn&apos;t need listing."